Remember that you will have folks on one end who say, "They don't pay much for it", which was true, but has changed and more is being paid by each Civil Servant, and then the other end that will say, "We pay 1/2 of the pension expense", which is not quite true either. Certainly having a pension does make retirement planning simpler, but that does not mean you should not (1) pay down your debts (2) save some money for retirement, just in case. What kind of Just in Case? Suppose the Government decides it wants to revamp Government Pensions? You never really know, do you? Many people though the Nortel Pension plan was safe, didn't they? @Big Cajun Man: It's true that things can change. Some say that a sequence of small changes is inevitable. But I'm sure that a public service pension is a lot more certain than the stock market. Did you inclure in your calculations that a significant part of that pension is taken from your salary ? It isn't a pure benefit, it's funded, at least in part, by lowering each and every paycheck. I've known a few people who went from private to public sector, and despite doing all the math, were amazed at the lower take-home pay. @Anonymous: Thanks for bringing this up -- I didn't mention it in the article, but at the time I assumed my contribution would be about 8%. So, I assumed that the pension amounted to about a 20% bump in pay. I understand that contribution rates have gone up a little since then. It depends the assumption - I get a little tired of people acting as if pensions are a hand out. In BC, for example, about 8% is taken off your pay and 8.5% is put in by the government. The former is obvious out of salary and I would argue so is the latter. As you point out even with the pension government jobs can be barely competitive with the private sector. Depends on what you do of course, some job in government don't compete with the private sector at all - as you point out. Regardless, the pension is part of your compensation or salary and hardly a handout. The main reason government pensions are great is b/c you are forced to effectively put in 17-18% of your salary your entire career you will have a solid nest egg at the end. Full stop. It's main value is the forced savings plan nature of it. @None: For true DC plans, the government's 8.5% is an accounting fiction. The government is on the hook for whatever it takes to make the promised pension payments. However, whatever amount the government must kick in, I agree that it is effectively part of salary and not a handout. While government pay was not competitive in my particular case, all the evidence is that governments overpay, on average, compared to the private sector. This is largely because the government does not do a good job of eliminating their hiring mistakes, and this brings down the average competence level. Many government workers are not good enough to get and hold a comparable private sector job at the same pay level. I agree that the main value of pensions is forced savings. However, the effective value of public service pensions in Canada is higher than 18% in most cases. I have a Provincial Gov't pension...it's a love-hate relationship. Both sides contribute ~8%. I did the life-time valuation calculations of pension vs private investment and in my circumstance, the pension won out (golden handcuffs). But as MJ said, it was close. Zero control over my money in all aspects: contribution, allocation, performance, or distribution. "Investment" in a fund which operates under different assumptions than my own personal investment fund. @SST: I've heard that some provincial governments are actually trying to move to a model where indexing of pension benefits depends on investment performance. However, if you're in a genuine DB pension, then you contribute 8%, but the employer match depends on the return assumption. If the government is overly optimistic about investment returns, as many commentators suggest, then their contribution is actually higher as my chart in this article shows. For a minority of people who can actually make sensible investment decisions, zero control is a negative. However, for the vast majority of people, zero control is actually a net positive. When I first entered the plan I received a letter stating my contributions (and future payments) were not based upon plan/investment performance. Within a year (pre-2008) I received a letter stating my contribution would increase due to poor investment performance. Rules can and do change, just look at the OAS. The thing with (probably) 100% of pension funds is that they are closet index funds that charge much higher expenses for matching or underperforming said indexes (you'll never find an index fund held within a pension fund). Not only that, but the larger a fund becomes, the more restricted it gets (e.g. they all invested in Valeant not because they wanted to, but because they had to). These are all real risks with real costs which I doubt the plans account for with any seriousness. Most plans are operating on a strategy set out decades ago and have not innovated with the changing economics. If anyone is thinking about cashing out their pension, this current low interest rate environment would be a good time to do so. Another downside: zero timing control. Need more funds because of a home purchase ? Or a divorce ? Not their problem, you don't control when to invest, it's done for you on each and every paycheck. Even if you're going broke otherwise. It might be a benefit to some that they can't mess up that part of their lives, but it's still a downside for many of us. Other downside: rules change, contribution rates change, governments claim they're broke and try and lower payouts.... and an individual has essentially no control. For example, the early retirement penalty in Quebec is going up, drastically. 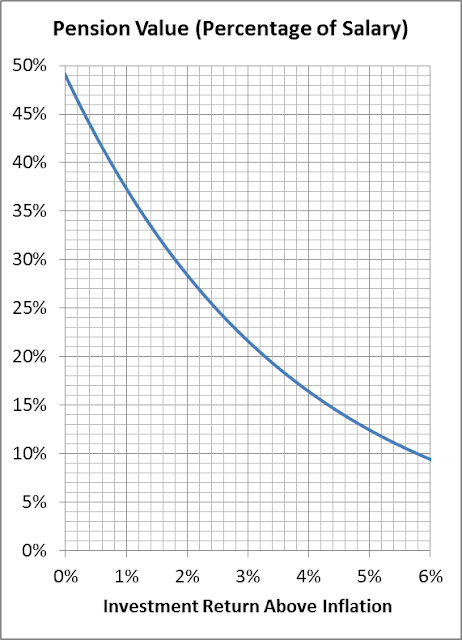 The only real upside, for an equivalent savings rate, is longevity risk. And even there, not all pensions are fully indexed (mine is indexed to inflation when it's over 2%, so essentially, 2% purchasing power is lost per year), so even the upside is limited. @Anonymous: Much of what you say is true, but these issues are minor compared to the issues faced by those who must save and invest on their own. Also, some of these apparent disadvantages are actually advantages in disguise. If you need more funds you can borrow. If lenders won't lend to you, then you are borrowing too much. So far, the changes governments have made are quite modest compared to facing a stock market crash and seeing your savings drop by one-third. Lack of indexing means you need to spend less than your full pension to save for the future. But again, this is a small slice of what people without pensions face. I worked with a large group of people who all left an employer that had a pension plan. We all got our commuted values and most of us were very happy with the greater control we had. Years later, many of them have botched the investing and wish they were back in the pension plan. I believe age is also a factor for valuing many of these plans. I roughly approximated what I thought my pension was worth when I started, and thought I could likely do better in the private sector, making more take-home and investing on my own... but the 2% of salary per year of service becomes more and more valuable as I get older. For someone just a few years from retirement with not much compounding time, a DB pension with a formula like that must be golden. @Potato: Age and experience in the markets has certainly reduced my estimate of my expected future investment returns. I definitely find DB pensions to be more valuable than I thought they were a couple of decade ago. I now think I was just wrong back then. 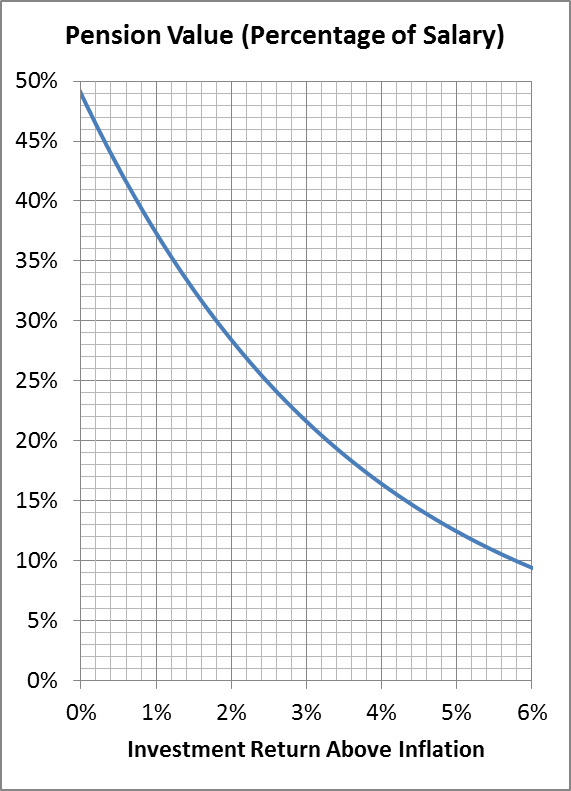 Not just the perception of value, but in terms of present value -- at least for HOOPP the formula (unless I'm misinterpreting it) is that you get the same stream of future income payments for the same contributions regardless of the age of the employee at the time. So a 35-year-old will get some stream of payments that won't start for 30 more years -- the present value of that is much lower than a 64-year-old who works and contributes and gets a stream of payments that start the very next year. Yet their contributions and years of service are equal. @Potato: Pension formulas vary and the descriptions of the formulas are usually unclear about indexing and other aspects. It's often the case that later years give more value than earlier years. But it's also often the case that later years are more valuable if you've already put in the earlier years. By this I mean that a 64-year old who works only 1 year gets a pension of x, while a similar 64-year old who works a 35th year gets a pension increment of more than x for working that last year. When this is true, the early years of working are a type of investment with a payoff much later.